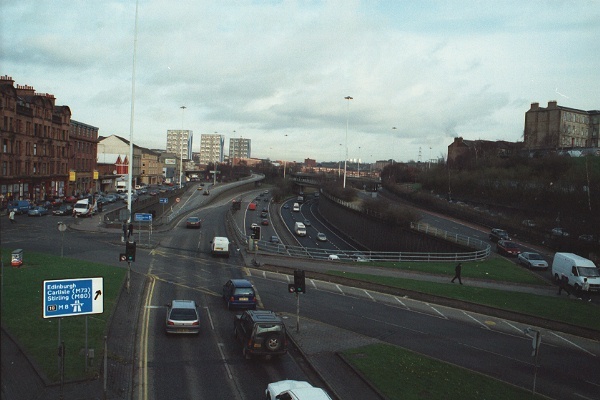 The St George's Cross interchange is where the motorway turns through about 90 degrees at the NW corner of the Inner Ring Road. 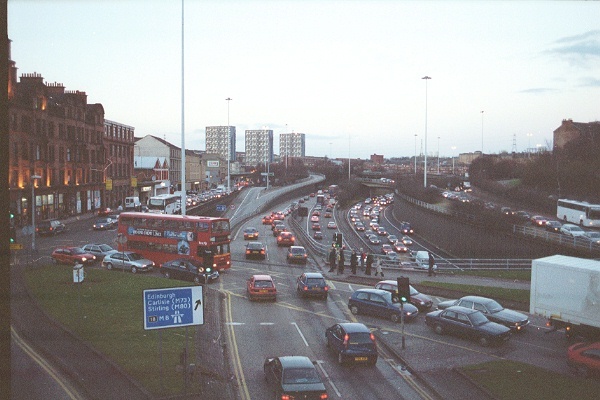 The intersection allows access to the A82, the dual-carriageway leading out to NW Glasgow, and to local streets in the Charing Cross area. 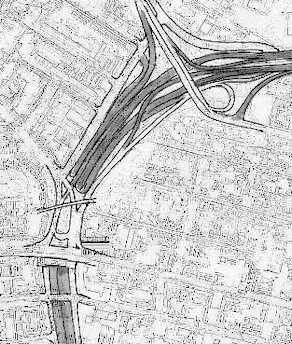 The motorway, and parts of the junction, are in a short "cut and cover" tunnel. 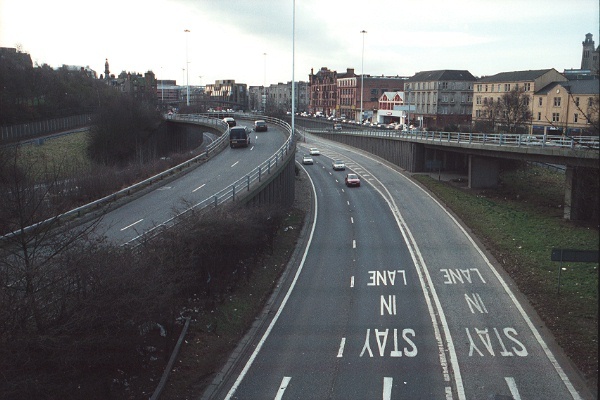 The A804 comes in from the south with one carriageway on either side of the motorway, and finishes leading to the east underneath the elevated motorway. View NE from the footbridge over J17/J18. Two lanes of motorway traffic exit from the tunnel on the right, and joined by a ramp down from the northbound A804 - the J18 entry. To the left of the ramp, the J17 exit climbs out from its tunnel (behind the bus), and splits. The left lane turns to traffic lights on the A804, while the right lane merges with the westbound A82. The yellow "box junction" in the foreground should prevent queueing traffic from blocking the crossing - you may only enter a box if your exit from it is clear. The A804 on the far left carries traffic in both directions. Southbound A804 traffic switches back over to the east side of the motorway here. From the same overbridge, with eastbound traffic leaving the motorway at J18, joined by the ramp up from the A804. I'm not entirely certain where the motorway actually ends on this slip road. 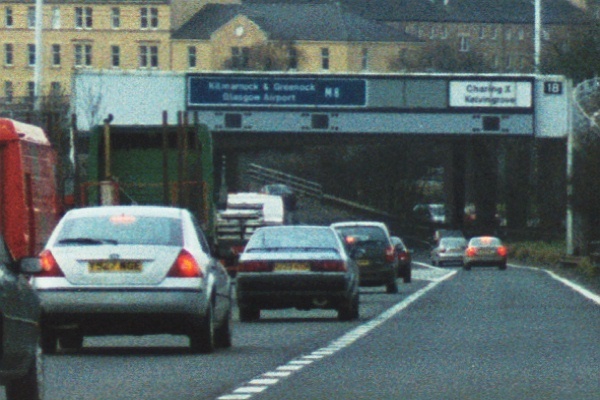 The "End of motorway" sign is actually after the merge of non-motorway traffic from the A82 - so the bus is legally parked on the hard shoulder. Looking SW from the A82 overbridge. The main reason for the right hand exit at J18 westbound (directly below, crossing over to the left) is the proximity to the J17 entry - right underneath the bridge. Again from the A82 overbridge, this time looking down on the eastbound carriageway with the J18 entry. All three lanes continue for several miles, hence the extended double white lines and "Stay in lane" marking. Crossing the M8 on the A82 there's a double slip road to the M8. The first joins the M8 eastbound - with a right-hand entry! 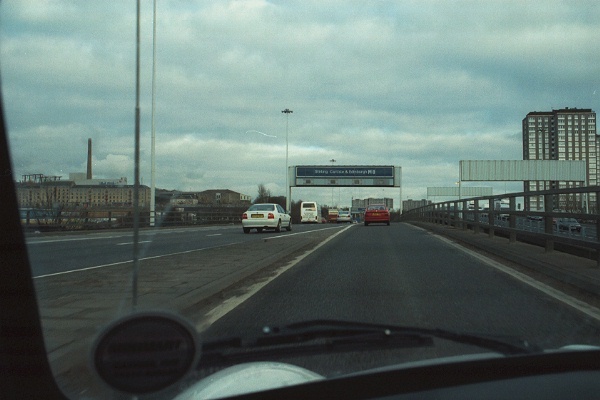 The second loops underneath to cross the westbound A804 traffic and join the M8 westbound. Close up of the sign. The diversion route will join up with the A804 eastbound, and follow it at least as far as J15. The motorway symbol is used to mean "Motorway regulations start immediately after the junction". 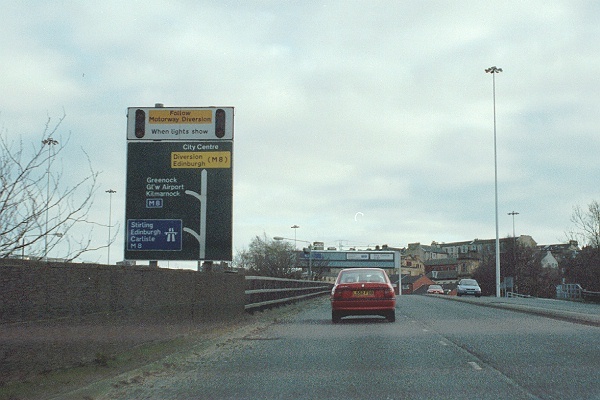 The first exit, with the large blue panel and the symbol, leads directly onto the motorway. 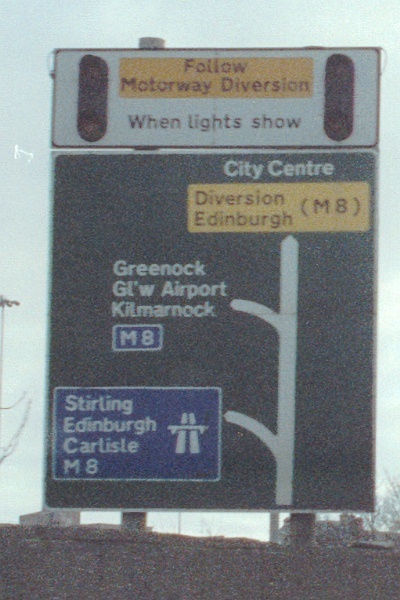 The second exit, with the small blue panel and no motorway symbol, leads to the motorway but via another route. The right-hand entry at J17 eastbound. The driver's comment was that it felt completely strange. Again, there's a 50 mph speed limit, and all four lanes continue for a couple of miles. 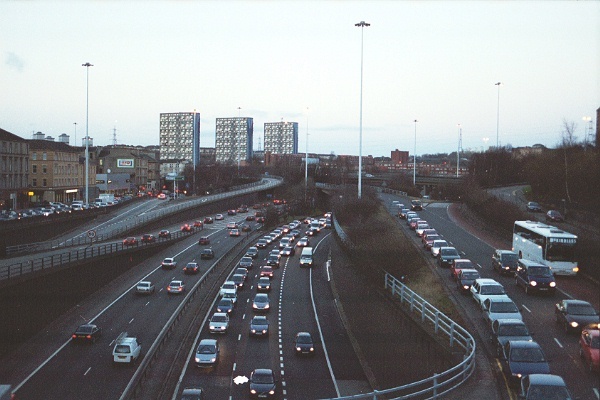 Traffic at peak times is usually much slower. 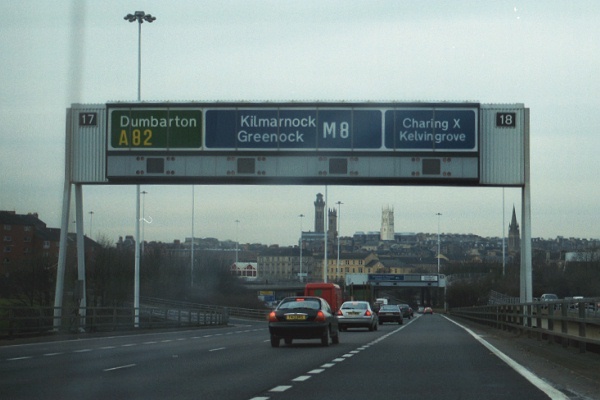 Gantry sign at J18 westbound, showing one of the two right-hand exits on the M8. Since it involves a lane drop, there are only two through lanes, and the speed limit is only 50 mph, the exit is far easier to reach than might be expected. 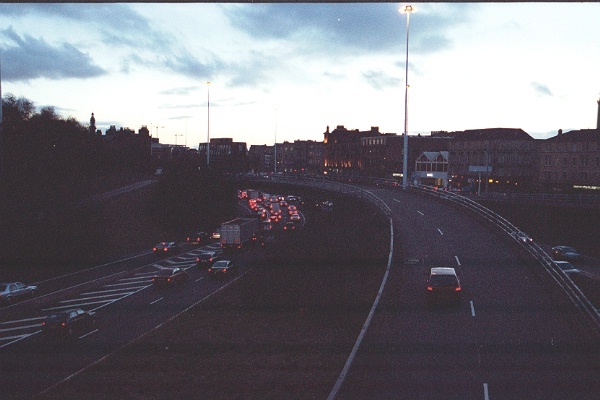 When it's very busy, traffic is usually at 30 mph or less. The last gantry for J17 westbound, with the exit lane for J18 already marked off.